Whew! The days have been flying by and it's already half the year. I thought I'd share some cards that I made recently. Lately I've been spending more time on Facebook and Instagram and neglecting this blog. The first 2 cards were made for our stamp club swap that we did the beginning of June. Our theme was to use the word "congratulations". I decided to make a simple card that could be used for either graduation or a baby. 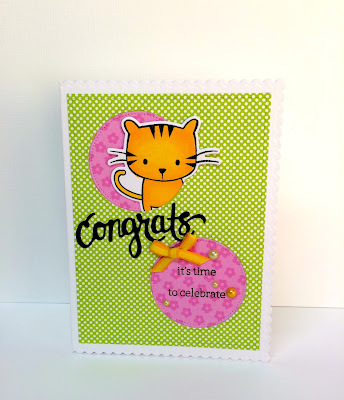 I used a Hero Arts stamp set called "playful animals" and "congrats" clear set. Patterned paper is Doodlebug Designs. And the cat is really glittery. I used wink of stella clear over the cat. 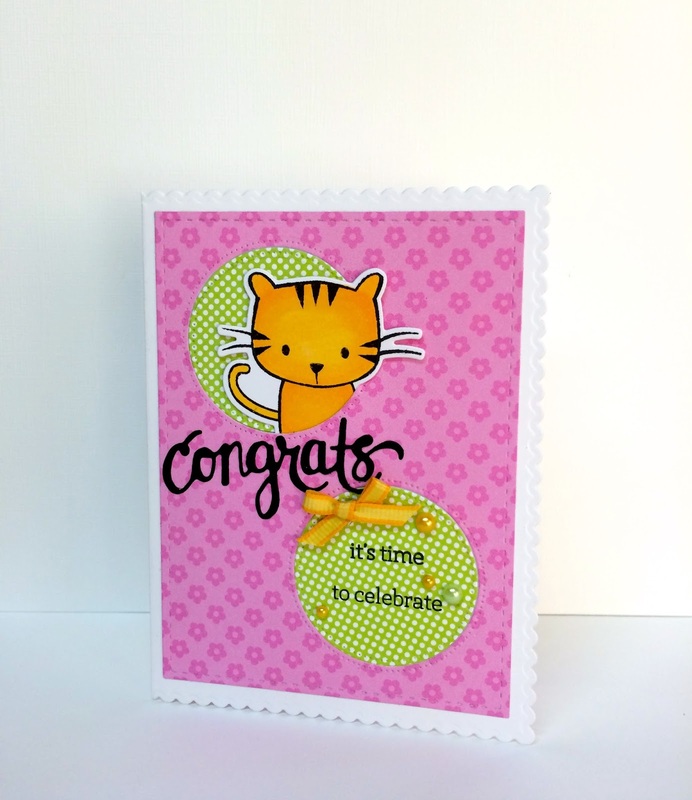 The next card is a new stamp set from Lawn Fawn. It is called "fintastic friends". It's such a cute set! And I had to get the stitched borders die set. I love all the different stitching dies that are in the set. 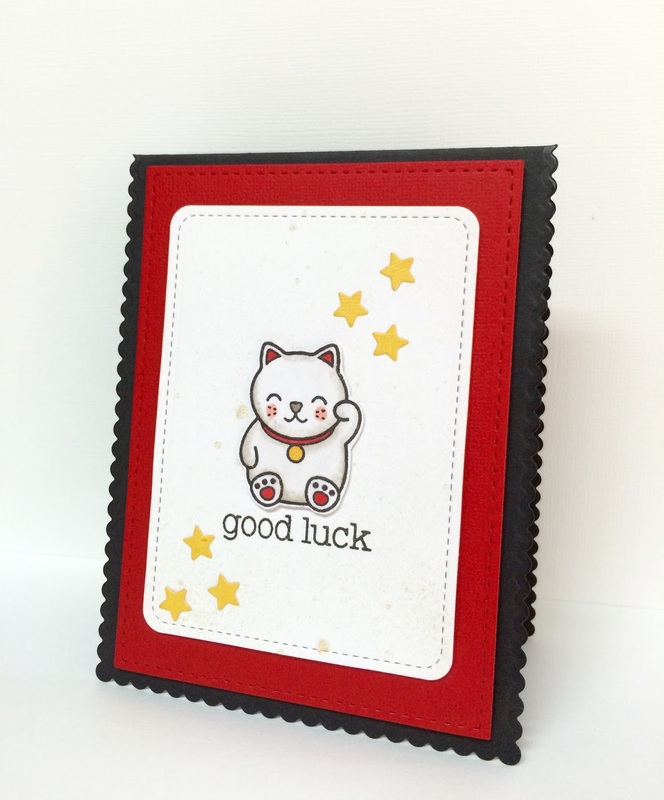 Today I finally finished this good luck card. I was struggling all week trying to finish it. I just could not get it right. You should see how much cardstock I wasted. It's all in my rubbish can. The stamp set is from Lawn Fawn called "my lucky charm". If you click on the picture, you will see the splatters of gold shimmer spritz in the background. If you've been checking back to see if I posted anything, sorry it's been awhile. Now that I have a real full-time job, I don't have as much time to spend making cards. If you're on Facebook, please friend me or follow me on Instagram @ccmiyashiro. 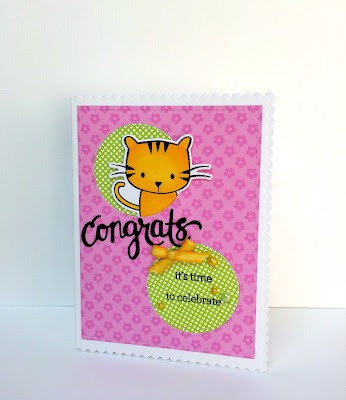 All three cards are so cute and make me hope that you will continue to post on your blog. I miss seeing your simple and graphically beautiful designs. You're on a roll Cheryl. Really love ALL the cards. Oh, I must add that cross-stitched border die to my wish list. Haven't see that one before. TFS.